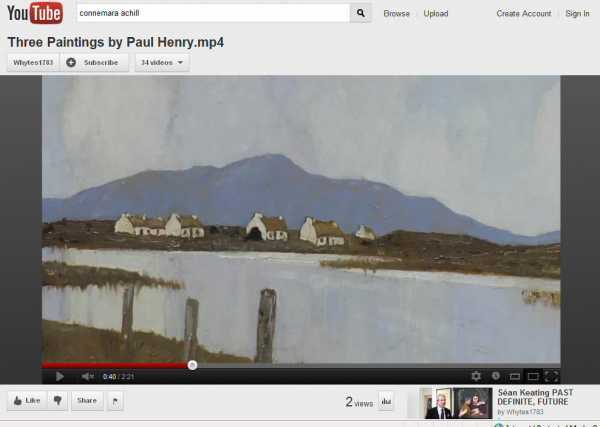 Regular readers will be familiar with my denunciations of the entire mountain oeuvre of Paul Henry deceased, late of Achill Island. Predictably enough nervous collectors have been shedding their Henrys ever since my comments were widely reported. Not for the first time have I caused a "run" in the market. But there you are: I use my powers sparingly and with terrible effect. PHenry was a Belfast born artist, the son of an evangelical clergyperson. He apparently suffered a "strict upbringing" leaving him fit for painting and nothing else . He trained in London and Paris and learned how to use "tone over colour". I'm not sure what that means except that his work appears washed out and flat. Let's be honest. He deliberately exaggerated the height of the sky so as to make mountains apppear comparatively small. He was a mountain hater: be in no doubt about that. In my youth I was blessed with fiery red hair and front teeth that were slightly too large for my then unformed mouth. My cunning parents introduced me to the John Hinde organisation where I became something of a star (in the company of a certain ginger girl who subsequently became editor of "The Sun"). Together Rebekah and I walked the valleys of our western seaboard with our asses faithfully in tow. How John Hinde irradiated the postcards of the 40s, 50s and 60s. What vibrancy! An unashamedly deep blue sky. Throbbingly purple mountains. And our hair. Profoundly, extravagantly, carotine red. John Hinde:now there was an artist!